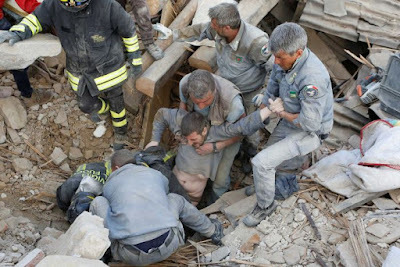 Lord, today our thoughts and prayers turn toward central Italy, where rescuers are digging through rubble by hand, hoping and praying to find survivors of today’s massive earthquake. We pray for equipment and military assistance to arrive quickly, and to efficiently and effectively get to work. We pray for people to be creative and generous in how they can help, through providing helpful resources and services of all kinds, including donating blood. We pray for medical personnel to have clarity of thought, and both physical and emotional strength, as they address major needs with minimal rest. We pray for those who are grieving, that you would sustain them, and that people would comfort and help the grieving even as the frantic rescue efforts continue. We pray for the living who are still trapped—that they would seek you, and that they would hold onto the will to live for as long as possible. May the dogs sniff them out promptly and the rescuers reach them in time. Bless those pastors and priests who are digging through the mess, ministering to people through rescuing both bodies and souls. In Jesus’ powerful name we pray, amen.